"We'd like to know a little bit about you for our files. We'd like to help you learn to help yourself." If those words sound familiar, you might be thinking of Simon and Garfunkel's 1968 song "Mrs. Robinson." But the concept applies to today's information giants, who are racing to combine Big Data, artificial intelligence, and machine learning to create products that will act as friendly virtual assistants in every corner of your home, and beyond. "Since last year and since Google I/O, we've been working hard, continuing our shift from a mobile-first to an AI-first world," Google CEO Sundar Pichai told the crowd. "We are rethinking all our core products and working hard to solve user problems by applying machine learning and AI." On October 4, Google released two new Google Home smart speakers. The $49 Home Mini is the size of a doughnut; covered in one of three fabric colors (chalk, charcoal, and coral), it’s designed to bring Google Assistant to every room in the house. The $400 Home Max measures 336.6 x 190 x 154.4 mm and emits room-shaking sound. It also adjusts its sound based on its location in a room, and it can hear “OK, Google” voice commands even when playing loudly. The Home Mini targets kids with games and stories, drawing upon Google’s partnership with Disney to bring characters from Star Wars and other franchises to Google Home. Warner Bros. and Sports Illustrated Kids are also developing content for Home Mini. “OK, Google broadcast this…” is a new verbal command that tells Google Assistant to deliver your next words to every Google Home device in the house, including Pixel phones. No one will be able to claim they didn’t hear the call to dinner or homework. Google's Pixel Buds wireless earbuds are the company’s answer to Apple Airpods. Pixel Buds are connected to each other by a wire, but link to Pixel phones via Bluetooth. But they don't just pipe music into your brain. Google says the Buds can translate 40 spoken languages in real time, approximating Star Trek’s Universal Translator. A pair of Buds will cost $159. Did you miss my recent article on the new Amazon Echo lineup? Similar to the Google Home, Amazon's devices are voice-controlled via the Alexa virtual assistant, with artificial intelligence baked in. Both companies are vying for space in your living room, kitchen and bedrooms. See Yes, There *IS* an Echo in Here. The Google Pixelbook (starting at $849) is Google’s latest imagination of a laptop computer/tablet. Its keyboard can be folded back 180 degrees in tablet mode. Google Assistant is always on, and there is a dedicated key that invokes Assistant. Of course, Google has new phones. The Pixel 2 has a 5-inch OLED display and starts at $549. The Pixel 2 XL has a 6-inch display and starts at $769. Both have improved cameras that can take “motion photos,” capturing a few seconds of video around a still photo. Using “augmented reality stickers,” you can slap a cartoon cat’s head on a motion photo of a dog and the head will stay in place as the dog moves around. 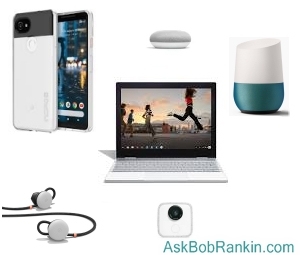 Google Clips is a camera that decides when to take pictures, and what should be the subject of those photos. Using artifical intelligence, it "captures beautiful, spontaneous images... and gets smarter over time." Clips learns to recognize the people (and pets) in your family, and snaps pictures when it thinks something interesting is happening. You needn't worry about Clips sending all your photos to the Mothership. It doesn't need an Internet connection to function, but can transfer selected images to your phone if desired. Finally, there’s the new Daydream View virtual-reality headset ($74) with improved lenses. It works with a Pixel or other VR-ready smartphone. More than 250 VR experiences are now available for Daydream, up from 25 last year. All of this new hardware has one purpose: to get Google Assistant embedded into every aspect of life, at home or on the go. Google Assistant is being improved, too, with a feature called Voice Match that helps Assistant know who it is assisting. When it hears “OK, Google, call Billy” from Dad, it calls the Billy in Dad’s contact list. When Junior says exactly the same thing, Assistant calls his pal, Billy. The object is to learn more about every user in a household, so that advertisements and other offers can be tailored more accurately. But don’t worry, the new Google Assistant also comes with parental controls to keep the kids out of trouble and parents out of debt. Most recent comments on "Google’s Artificial Intelligence Strategy (and new products)"
"The object is to learn more about every user in a household, so that advertisements and other offers can be tailored more accurately. But don’t worry, the new Google Assistant also comes with parental controls to keep the kids out of trouble and parents out of debt". Once they get inside your house, then they want to get inside your head! GOOGLE IS FRONTING FOR THE FASCIST CIA! Do you remember the CIA experiments with LSD? MKULTRA on steroids is next! "Its keyboard [The Google Pixelbook] can be folded back 180 degrees in tablet mode." I would guess you mean 360 degrees? It's bad enough with all the trash phone calls we endure these days and now they want to control all the advertising. A major point that isn't addressed in the previous email comments is what if this is taken over by government or a political party like the majority of the news media has been then truly 1984 will begin. Very scary future for us. Perhaps I lack imagination. What house is so large that the cook cannot call all the children for dinner without a public address system? All I imagine now is Downton Abbey or a P G Wodehouse book where the butler hits a gong to let everyone in the castle or mansion know it is time to change for dinner. Seems funny to spend all that money for an electronic gong. that are lured in by it. Yes, I am terrified that the 'gubmint' might find out that I prefer Ford and GM vehicles over Toyotas. The tin foil hats are definitely out. Seriously, it's not as if the government couldn't know far more than that about me without Google's information about my consumer preferences. "Someone" has always found a way to find out consumer preferences, whether it be via Neilsen ratings, paper surveys, snail-mail lists and catalogs and more. I have no real issue with advertising. If I'm interested in purchasing a product, advertising helps give me some of the information I need to move forward. In some cases, it simply lets me know that a certain brand of that product is available as an option. Nothing wrong with that. When I'm surfing the Web, I'd rather than the ads served to me fit what interests me rather than be for things that do not interest me at all. This isn't about "mind control" in any nefarious sense of the word. It's about advertising. To make money. You know - old fashioned selling using modern technology. And, as always, if that bothers you, then you don't have to use the products. Does anyone else think that in 10 years or so, we're all going to be scrambling around trying to get our privacy back? Mine must be broken. Every time I open it 360 degrees, it instantly closes again.